Though its culmination is still a few days away, I can already say that the 2012 iteration of the NCAA Division I Mens Basketball Tournament is the most memorable in my years of watching the Madness that comes with March. This year's tournament hasn't had quite the same level of exciting moments and cinderella stories as many of those in the distant or recent past, but I personally have never had such an immediate connection to college basketball's championship tournament or the kind of of vivid experiences and encounters with the action that will no doubt make this year's Big Dance stick in my memory like no other before it. For me, this year's road to the Final Four was indeed the one less traveled by. Before the tournament field was even decided upon, I had already been given a glimpse into what was to come, starting with a trip to New Orleans and the hoopla surrounding this year's SEC conference tournament. I hitched a free ride with two friends to the Crescent City, where we met up with another pal and set down temporary residence in a quaint apartment in the city's Marigny district. It provided a home base from which we experienced the tournament's exciting and surprisingly Blue atmosphere. Two of the three friends I spent my weekend in New Orleans with are dyed-in-the-wool Kentucky fans, and they made the pilgrimage to Nola without tickets for any of the games, but just to be present in the city where their team was making its run through the conference tournament. They were not alone. If this picture doesn't do justice to the number of Kentucky fans that infiltrated the city for the weekend, let me try to add to the 1,000 words that the photo hopefully imparts. As depicted, Bourbon Street was filled to the gills with the Kentucky faithful for the entire weekend. I was absolutely floored by the sheer number of fans that came down to watch and support their team. One reason being is that the trip from Kentucky to New Orleans is not exactly a short one (I believe we made our trip in just over ten hours by car, and that was with an extra hour shaved off of our time thanks to a shift in time zones). The other is that the UK fans were there for a conference tournament. With Kentucky already in control of a number one seed in the national tournament, it amazed me that so many fans turned out just to cheer their team on during their conference's tourney. Also, as a die-hard Ohio State fan, I thought my team traveled well. No affront to any of my fellow Buckeye faithful, but Wildcat fans can do more than give us a run for our money when it comes to traveling in support of their school. They flooded that city (ouch, still too soon?) and made me think that some sort of famine had induced a Lexington diaspora to New Orleans, which is still reeling from a storm-induced exodus of its own. To add to the excitement that was clearly evident among my comrades and the rest of the Kentucky fans that were crawling all over the city, the French Quarter bar we selected to view the Wildcats' first game at was filled with Kentucky fans of a truly select breed: the extended family of the team's star center Anthony Davis. Grandma, grandpa, uncle, aunt, twin sister--just about everyone except the dynamic freshman's mother and father, who were attending the game at the New Orleans Arena--were right there alongside of us, cheering on their relative with the ungodly wingspan and the rest of his talented teammates towards a conference championship. My Kentucky-fan friends were over the moon, and I was similarly excited to be around the Davis clan, who were warm and energetic throughout the game (and the following day's game as well). They came from Davis' hometown of Chicago and also Mobile, Alabama, where some of them have put down stakes, and called their shot-swatting kinsman "Fat Man", a nickname he apparently earned as a particularly hefty infant. It was amazing to see the games through their eyes (which were not, before you ask, framed by unibrows) and be surrounded by Kentucky fans that were both long-time supporters and genealogically invested in the outcome of the games. In the end, Kentucky came up short in the conference championship game to Vanderbilt, but that did little to detract from what for me was a memorable (though somewhat hazy) weekend in New Orleans. I was allowed a second trip to a city that I am truly falling more and more in love with the more I get to experience it, and a unique window into a side of basketball fandom that I hadn't really appreciated up until this point. But my four days in New Orleans were only a warm-up to my tournament experience, which truly got going a few days later back home in Louisville. That's because unlike the New Orleans trip, a friend and I had already secured tickets to the games being played at the KFC Yum! Center on both Thursday and Saturday. That gave us four games from the round of 64 on Thursday and two more in the second round for Saturday. I was in high spirits on my bus ride downtown to see the games, and was happier still when I got to my seat, which though high up in the unusually cool air of the Yum! Center, was still a fantastic viewpoint to see the games. And to be perfectly honest, like some of the bigger stars I've seen at large arenas in the world of music, I was thrilled just to be there, no matter how good the action on the court ended up being. Well, it ended up being great and the whole day, while exhausting to a certain degree (especially considering the lack of alcoholic libations available for sale), was sublime. I spent the day surrounded by the tournament atmosphere, which was again dominated by fans of the Kentucky Wildcats. 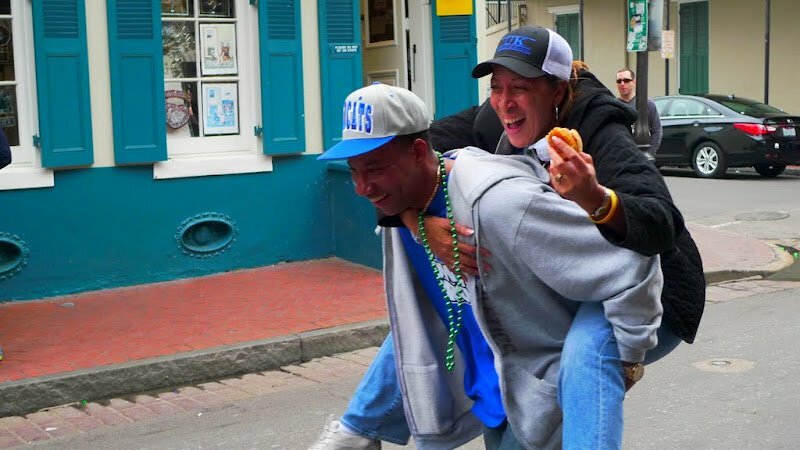 "Kentucky fan and Louisville fan together on Bourbon St.?! Think that's very combustible? Head on a swivel." JR was referring to the fact that like the SEC tourney, the Final Four will take place this weekend in New Orleans, but I have to say that I don't think even Bourbon Street will compare to what this city is going to be like come Saturday evening. Here in Louisville we definitely have our fair share of parties, with the Kentucky Derby being the shining example of the kind of debauchery the River City is capable of, but I don't think that any Derby weekend is going to be able to compare with what's coming when the Cards and Cats meet up with a chance to play in the championship game. I'm not alone in this opinion, and if you've been around any sort of public sphere here in Louisville since the match-up solidified last weekend, you know that I'm right. "The Game" is a topic of conversation everywhere from sports bars to coffee shops to supermarkets, and I'm as giddy as a school kid that I get to be here for what has to be one of the most contentious Final Four match-ups in the history of the NCAA tournament. I always come back to a Rick Pitino quote that I'm not sure I read or heard during a radio interview when I think of the UK/U of L rivalry. I'm paraphrasing, but the basic idea coach imparted was that while he was with Kentucky, there wasn't a Louisville fan to be found in Lexington, but when he took the job at U of L, he realized that Louisville is split nearly 50/50 when it comes to fans of the Cards and Cats. That makes for an electric environment here in Louisville every time the two teams meet, but it has nothing on the atomic level of energy that is going to be pouring out of every nook and cranny of this town come Saturday afternoon. Jesus, I'm getting so wrapped up in Blue and Red that I almost forgot that my team is playing in the Final Four's other game against the Kansas Jayhawks. How about I say good luck to both of the Kentucky teams involved in this Saturday's action, and hope that they get to play my Buckeyes on Monday night in Nola. I'm not really invested in the outcome of the instate battle that's about to go down in the Big Easy, but certainly can't wait to watch it all unfold and see how many of the buildings near the U of L campus remain standing if the Cards are able to gut out a victory. As Romey tweeted, keep your head on a swivel if you're on Bourbon St., and do the same if you happen to be shakily making your way down 3rd Street here in the Ville on Saturday.